In 2017, Tiler Peck became the first woman to curate The Music Center's BalletNOW program. Photo courtesy of Vulcan Productions. In case you've been living under a rock, we've been counting down the days until the July 20th release of Tiler Peck's documentary, Ballet Now, all summer. 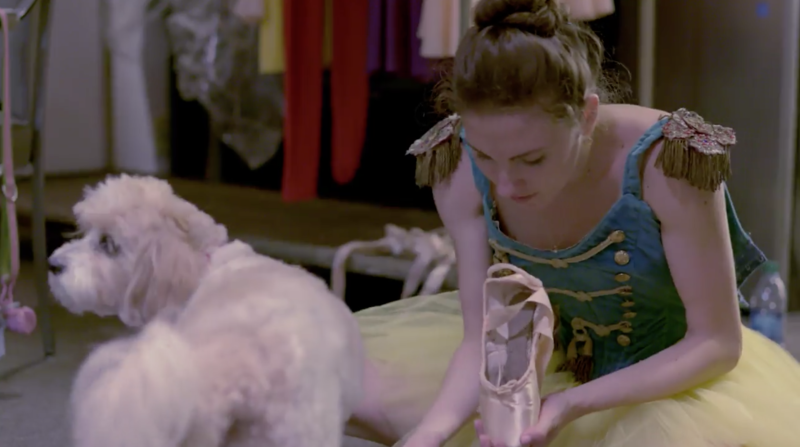 Officially available for streaming on Hulu, the documentary follows the New York City Ballet principal tackling a new role as the curator of The Music Center's BalletNOW program in Los Angeles, CA. The three-performance program featured an international cast of 24 dancers, 15 pieces across multiple dance genres and a live orchestra—all organized (and often danced) by Peck. Phew, we're exhausted just thinking about it. As if that wasn't challenging on its own, Peck signed on to have the days leading up to opening night filmed. Produced by Paul G. Allen's Vulcan Productions, Emmy® Award-winning actress (and Peck's friend) Elisabeth Moss, and Stick Figure Studios, the team turned BalletNOW into a behind-the-scenes experience for everyone to enjoy. We caught up with Peck ahead of the documentary's release for the inside scoop on her curatorial debut, the filming process, and a few very stressful moments where she wondered how it would all come together. How did the opportunity to put together BalletNOW come about? The Music Center brought me in—I was visiting my family in California at the time, and they had called a meeting with me. I went to the offices, and they asked me, 'How would you feel about curating these evenings?' They said, 'You'll be the first female that we've asked, what do you think?' I couldn't quite believe it at the time, but I was also super excited. The first thing I thought was how fun that this will be in California, where I'm from. I can share this with family and friends that can't make it to New York to see my shows. And then, on top of it, to be the first woman curating the program—that was really exciting for me. It was also very stressful because I put pressure on myself. I wanted it to be a success so that possibly, I would inspire other women to put themselves forward in things that maybe they never thought they could do. For me, it wasn't about just getting asked to dance, where I can fall back on what I know and love to do. This was a whole other element, and I didn't know what was going to happen. Had you ever put together a production like this before? I had put together a little gig in Key West with six dancers, but nothing to this magnitude—it didn't have an orchestra, there weren't 24 dancers, it wasn't the size of the New York City Ballet stage. This definitely felt like a first for me. Was there anyone you reached out to for advice? I did a lot of it by myself, honestly, but I think I learned a lot from Damian Woetzel—going to his Vail Festival for the past 10 years or so, and watching him run it—he's always been a huge role model and figure in my life and career. I think I learned a lot just from watching him. You always pull from what you know when you're going into something new and then try to figure out the rest as you go. How much of the production for this did you do ahead of time? I'd say it took me about 9 months to plan from beginning to end. Meaning, not the part where we were actually putting it together, but just in my head—thinking which dancers I wanted, and which pieces. And then things would come up like certain dancers wouldn't be available and so I had to switch the pieces, or we couldn't get the rights to certain things. So there were a lot of things I never thought I would have to deal with like the Trust and all of the rights. I was having to deal with all of that, and when The Music Center first asked me, all I thought I was doing was picking the dancers and the rep. I thought, 'Okay, that doesn't sound too difficult.' And then when I got started I was like Oh. My. God. I had no idea. Was it weird getting used to the cameras being there for the behind-the-scenes process? Literally, one person was with me the whole time. Steven (Steven Cantor, the director and producer) was like, 'Meet Casey, he's your boyfriend for the next four days. Anywhere you go, he goes.' I felt super comfortable with him, and because it was just one person, I didn't necessarily feel like there was a camera in my face—besides when I needed to change. Honestly, I didn't have time to worry about the documentary. I was so focused on 'Okay, I have to get these performances on.' That was all I thought about. Oh, I know, when I'm in therapy, I look so tired. She's a very close friend, and so there's that moment where I walk in and you see me kind of take a breath and I'm like, 'Oh my God, I don't know if this is actually going to happen.' My body hurt, and I also had food poisoning, I was just like, 'This cannot be happening right now.' There were a lot of times where I wondered if it was going to happen. But it's been like that at NYCB, and somehow you always pull it together. How did you keep your cool under so much pressure? The most important thing for me was that I come across as myself, which I think that you get from the film. I tried to not take any of the stress out on anybody and to make it a really positive atmosphere. There is one part where I lose it. That part where I say, 'You guys, you've been talking about putting this Slip No More on the floor for like five minutes. You just told me it's going to take 20 minutes, and we have 30, so stop talking about it and just put it on the floor!' When I watch that part, I laugh because you can see that I'm definitely a little stressed. I think my favorite part is my grandma. When she's in the dressing room with the lights around her, she looks so glamorous. I love that part. It means so much to me for those shows to have happened while she's around because my grandma played a big part in my training and in getting me where I am. Would you do something like this again in the future? You never know if you're going to be good at something until you try it, but this showed me that it's possible. It also gave me the idea that maybe I would like to run a company some day. I felt like I was good at managing everybody's needs—and there were a lot of need. I just love sharing what I know with the younger dancers. So if the opportunity arose in the future, I think that yeah, I'd definitely love to do something like this again.